Scottish Borders Council could be in for a larger settlement grant than first expected following a deal between rival parties in Holyrood. A new funding settlement for local authorities has been agreed in the Scottish parliament following a last-minute deal between the majority Scottish National Party and minority Greens ahead of a vote on the annual budget. Derek MacKay, the Scottish Government’s finance secretary, first unveiled proposals for the budget in December 2018, including added funding for schools and the National Health Service, as well as increasing income tax for those earning £50,000 or more. Opposition parties moved to block the bid, partly due to the SNP refusing to rule out calling another independence referendum and also because they say the budget would result in a £319m funding cut for local authorities. However, the deal with the Scottish Greens means the budget is now likely to be passed. Scottish Borders Council leader Shona Haslam said: “This settlement does go some way to mitigating the cuts that we were expecting. However, it has a narrow focus in terms of local taxation. “Given the consultation only concluded last Friday, it is surprising that the Scottish Government were able to announce the tourist tax today. “While this budget gives some extra money to local government, it still leaves us with a big gap to fill. “I welcome the extra cash for essential services, but we still face challenges. “The extra tax-raising powers are not appropriate for the Borders. We have a fledgling tourist industry with many small providers, and we need to protect that industry, not burden it with more bureaucracy. “A 1% rise in council tax in the Borders raises £500,000, so even with the cap increasing again, we are still left with a big hole to fill. The new deal with the Scottish Greens includes an extra £90m for the core local government settlement, a move to three-year local authority budgets and legislation that will give councils control over tourism taxes. The deal also includes raising the council tax cap, meaning local authorities will now be able to increase council tax by 4.79%, up from 3%. Fellow Tweeddale East councillor Stuart Bell, also leader of the council’s Scottish national party opposition group , said: “Significant announcements have been made on a phased development of alternatives to the council tax. 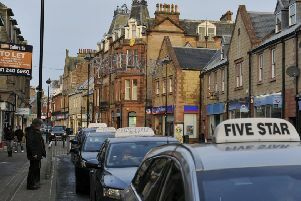 “Although I don’t advocate that locally we should immediately take advantage of the proposal to give local authorities power to introduce a tourist tax, or the suggested workplace parking levy, these are adjustments that some Scottish city authorities will want to take up after the necessary legislation is approved. “I am also pleased that talks on meaningful alternatives to council tax will restart and that with a three-year funding settlement, as opposed to the current one-year deals, there will be more clarity for local authorities on future funding. “There are also small changes in the 2019-20 revenue grants for local authorities. Despite the constant chant of despair from the Borders’ Tories, I said all along that the December announcements of funding for the council were only provisional. “The Conservatives who lead the council like to highlight that we were told we might see £4.6m less for core revenue funding next year, conveniently forgetting to talk about promised money for new services such as the massive expansion in early learning and childcare. “They also omit to tell Borderers that we are getting £4m more next year as capital funding, almost exactly offsetting the change in revenue funding. “We must wait until the detail of the £187m package from the Scottish Government is analysed by officers, but my provisional calculation is that the new funding announcements could give the council more than £1.5m, meaning that we will see a clear cash increase in next year’s funding for core revenue and capital. “Sadly, we are being told that the Conservatives in Holyrood may vote against these welcome changes. Rachael Hamilton, Conservative MSP for Ettrick, Roxburgh and Berwickshire, said: “Thanks to the SNP, Scots across the country are about to be hit by a triple tax bombshell. “This budget not only taxes aspiration but taxes people for driving to work, which is quite frankly ridiculous in a constituency like mine, where travelling by car is essential. “We will pay the highest income taxes in the UK, council tax could go up and now you might even be taxed hundreds of pounds a year for taking your car to work. Mr Bell added: “My big message to the Borders Tories is to drop their mentality of dependence and to take responsibility for balancing a Borders budget. “The power to make change is in the hands of the council and they should stop trying to shirk local responsibility. Power to finance 2019-20 expenditure is in the hands of the administration. “Derek MacKay has announced that more could be raised from further increasing the local council tax to a new upper level of over 4%, as the Scottish Government has lifted the previous cap. “Further, the Tory-led Borders administration should take responsibility for properly managing our council’s affairs. “Figures I have seen show that there are unrealised savings of over £3.3m that were planned in last year’s budget which have not been realised in practice. “If these saving had been made, then there would be less cuts this year. If we hadn’t poured it away in unrealised savings and could add this new money, perhaps the Borders’ revenue finances would balance.